Okay, I am having so much fun with this little mini!! After finishing up the little rainbows I started framing them in white. I love how the white serves to make the colors all the more crisp. Then I played with the layout and sashed each of the framed rainbow blocks with some black. The remind me of old slide projector slides. So cool!! I used the two remaining blocks to make a label for the back. I need to finish the back now so I can get to quilting it. And speaking of quilting . . . This is my current quilting plan. What do you think??? I would love your creative opinions!! 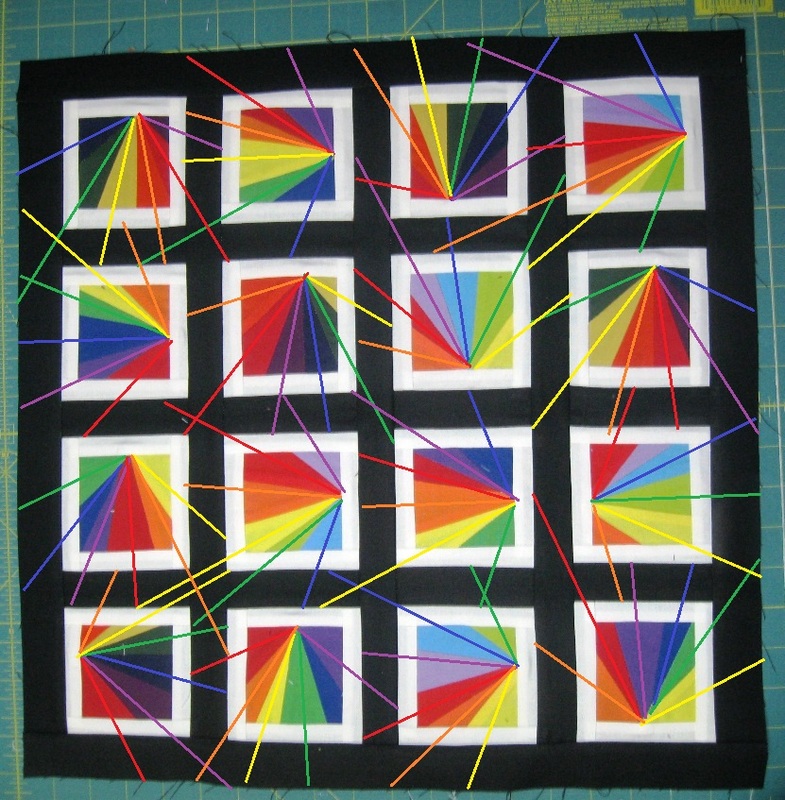 Love your plan for the quilting, it totally reminds me of playing with the lasers and prisms in physics lab! Your quilting plan looks awesome, that is one lucky gal to receive this from you! I love your quilt top. And love the little pop of white you added between the blocks and sashing. Quilting I would just follow the rays of each block with straight line quilting. clearly -- you have Creative covered! Love it. Beautiful! I love your quilting plan. Brilliant! Love those old slides and you're quilting plan is fantastic! wow! go for it... maybe a thicker line(s)?? Dang girl you are rockin' this one! I can't believe you are giving this one away! I think you need it in your teaching pile, it would be a great class. Love it. OMG sooooo incredible - those colored rays make it sing! I love it in the rainbow colors! Love the quilt. I think the quilting would have more impact if you only chose a couple to emphasize and the rest were straight line quilted. It will be beautiful whatever you choose. I think your quilting plan takes this quilt to a new level... I'd go for it! 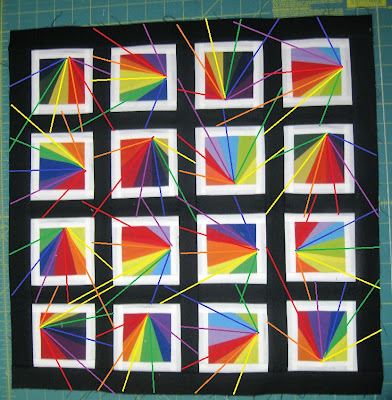 Your blocks look like little prisms and your quilting plan re-enforces the refraction theme. I like it. Oh wow....that quilting will be awesome on it. Love this top and your quilting plan is just brilliant! Can't wait to see it finished! Wow, your quilt instantly drew my eyes over at Quiltstory! Going to become a new follower to see it finished! You are so clever! The quilting rocks. Are you going to use a 12wt cotton for quilting? This is a very cool quilt! I really like the white and then black sashing, and I think your quilting will look very nice! It is gorgeous. Can't wait to see it all finished. Your quilt is amazing, and your quilting idea is just perfect!! Great creativity!! Hugs!! Your quilting plan for this quilt is perfect. Your quilt is going to be amazing. Very cool. And your quilting idea is so different and interesting. I'll look forward to seeing the finish. It turned out so great. I think that quilting it that way would be great!! you really did a great job! sometimes a color scheme makes all the difference, and trying again! I really do see prisms now. extending the prisms' rays of light into the sashes and borders as quilting just enhances the "light" bouncing around.